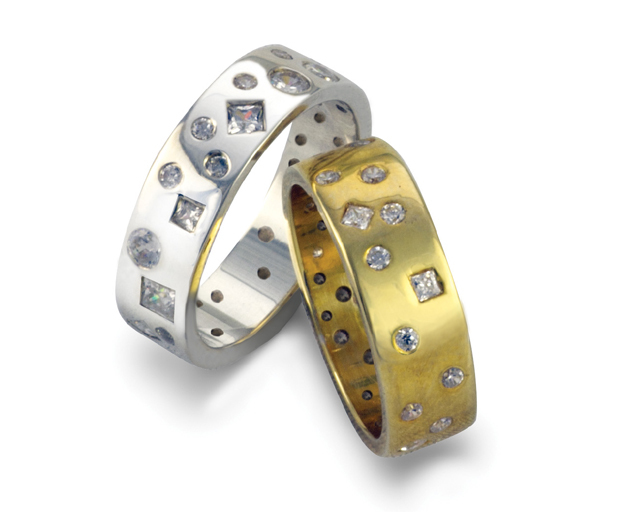 Diamond scatter eternity rings also make excellent diamond wedding rings. Handmade to order in your choice of metal: platinum, 18ct rose gold or 18ct yellow gold. Those pictured and priced here are 6mm wide and 2mm thick with a comfort curve on the inside. 40 diamonds, a total 1cts are used in the full eternity ring. In this version the diamond pattern goes all around the ring. The half carat version where the pattern of diamonds extends half way around the ring 20 diamonds are used. Please note that large ring sizes over T will need extra diamonds, very small ring sizes will need less. The price will be adjusted on checkout up or down depending on how many are used.